Simple custard (four ingredients) cooked inside of a fresh coconut. 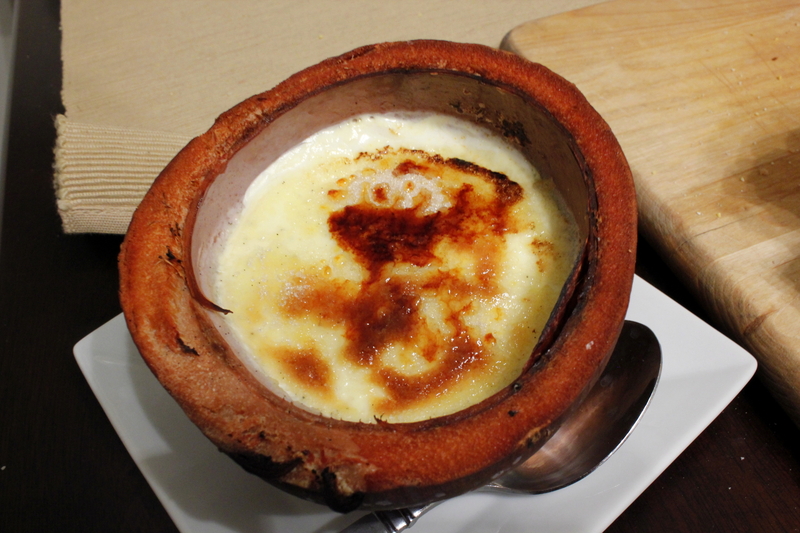 The flavors of the coconut flesh permeated the custard as it cooked for a nice lightly flavored coconut creme brulee. Finishing this off with some sugar and a blowtorch gave a nice thick shell that every creme brulee needs! Added bonus (thank you Alton Brown) save the pods from your vanilla bean and store them in sugar - the sugar will pick up quite a bit of vanilla flavor. 1. Cut 1/2" off each end of the coconut so you have a flat end on each side. 2. Cut the coconut in half (parallel to the flat ends you just made). Be careful to save the coconut water and drink it, it is delicious and a great source of electrolytes. 3. Place coconut halves into a baking pan and place in oven on top rack. 4. Preheat oven to 325 F.
5. 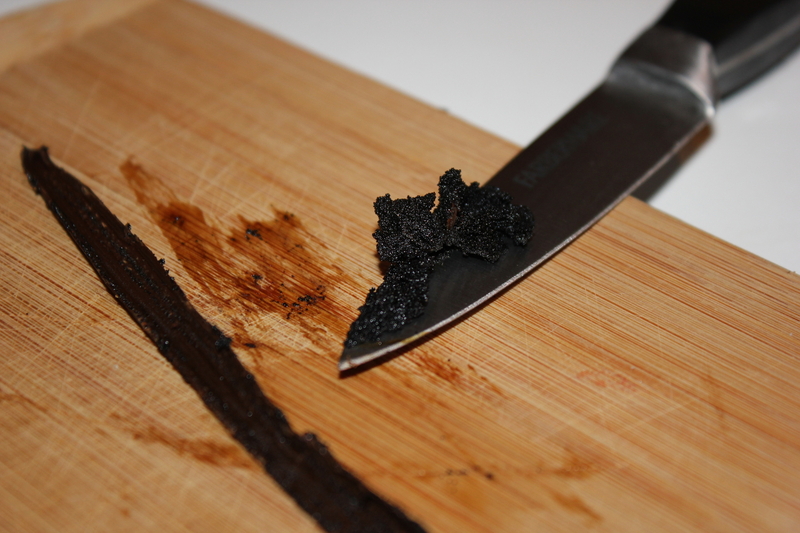 Split vanilla bean and scrape out pulp with the back of your knife. 6. Put heavy cream and vanilla (pod and pulp) into a saucepan on medium high heat. 7. As soon as cream starts to bubble, kill the heat allow to rest (covered) for 15 minutes. 8. Whisk egg yolks with half (1/4 c) of sugar. 9. While whisking, slowly add cream, a little at a time, to temper the eggs. 10. When all cream is combined, pour into coconut shells and bake for 60 minutes or until custard is set but center still jiggles slightly - this may take up to 90 minutes depending on how warm your coconut is. 11. Chill for at least 3 hours before serving. 12. Immediately before serving, sprinkle sugar on top of custard and hit it with the torch until all sugar is melted, swirl to coat top of custard with liquid sugar.